Eyes are pretty darn complicated, which makes them cool models for studying complex trait evolution. Maybe the first time I realized how interesting eyes are when I saw this by the oatmeal about the amazing-ness of the mantis shrimp (are they your new favorite too? ), or when I first listened to Colors (or the update) by Radiolab (which also mentions the majestic and clearly magical mantis shrimp). Graphical Abstract (Picciani et al., 2018). Eyes exist at different levels of complexity, at their most basic they might have some photoreceptors, pigments, or maybe even lenses or mirrors. As Picciani et al., (2018) from the Oakley lab at UC Santa Barbara, point out, many researchers focus (no pun intended) on the evolution of eyes in bilaterian animals, essentially the animals that have a right and left side (like us). As you might imagine, these visual systems are incredibly intricate, and unraveling their evolution is quite the challenge. The phylum Cnidaria includes plenty of marine creatures you might be familiar with, such as corals, anemones, box jellyfish, siphonophores, and true jellyfish. It might be surprising to realize that even these critters can have simple eyes. 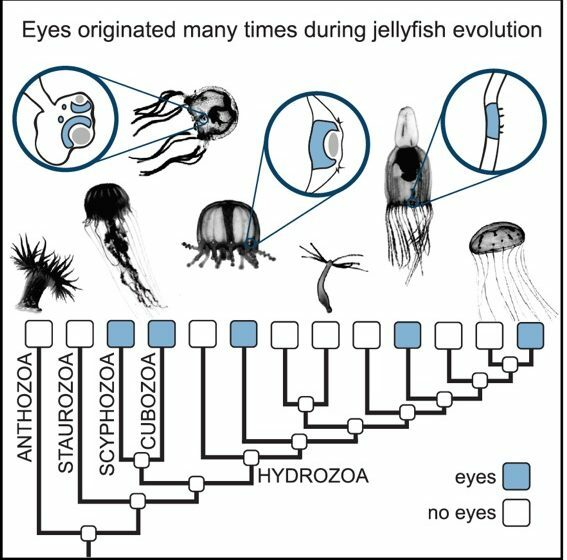 The article by Picciani and colleagues reports that eyes actually evolved multiple times among the Cnidaria. Amazingly even in organisms with very simple nervous systems, light sensing and basic visual systems have evolved more than once. Figure 1. (Picciani et al., 2018). Eyes Originated between 8 and 13 Times in Cnidaria. 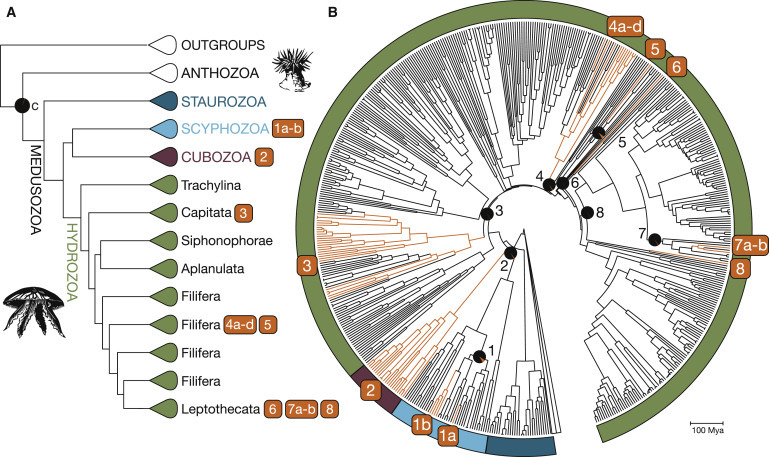 The authors constructed a massive phylogeny spanning 1,102 species of Cnidaria using 5 genes (6,629 nucleotides), and overlaid morphological data regarding the presence (or absence) of eyes collected from previously published literature. They found that eyes evolved between 8 (on the conservative side) and 13 times in Cnidaria! They outlined evidence supporting multiple origins for eyes, and that sensitivity to light was broadly present across the Cnideria. Figure 2. (Picciani et al., 2018). Eyes of Separate Origin Differ in Ultrastructural Details. Figure 3. (Picciani et al., 2018).The Evolutionary History of Cnidarian Opsins Is Consistent with Multiple Eye Origins. Picciani et al., also concluded that sensitivity to light developed before eyes (makes sense) and finally they analyzed genes (called opsins) involved in the development of vision. 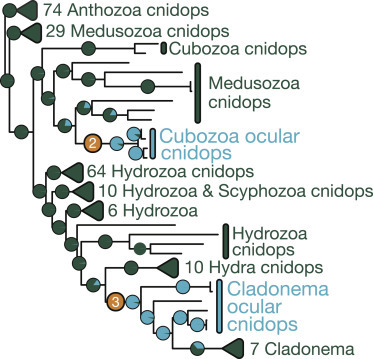 From an extensive phylogeny of opsins the authors determined that the results supported their conclusion that separate eye evolutionary events occurred across the Cnidaria. This nifty paper answered many questions while raising a bunch more, setting the stage for interesting follow up studies. Next time you see a jellyfish trying to evade the “Pokémon” robot arm, maybe you’ll wonder why that critter didn’t see it coming. This entry was posted in bioinformatics, evolution, genomics, next generation sequencing, phylogenetics and tagged Cnidaria, complex trait evolution, eyes, opsins. Bookmark the permalink.